The giant playing this game of Tetris is doing a terrible job. All the bricks are at weird angles – they’ll never get a proper stack! Every alleyway should be lined with the illusion that you’re about to be crushed by falling Tetris bricks, don’t you think? In fact, I bet if all alleys were to have similar lighting decorations, they might lose some of those negative connotations that make you power walk, look nervously over your shoulder because you’re overcome with paranoia, or take the long way around. Sadly, these aren’t just uber cool street lights. 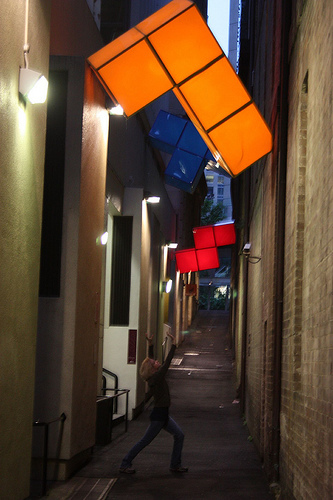 Giant Tetris, or “One More Go One More Go,” is part of an outdoor art exhibition in Sydney, Australia called Live Lanes – By George! But what a great way to pay homage to a great game – not to mention a great way to reel in the tourists. The girl in the pic had better watch out though – I see a cartoon-style squashing on the horizon. Thanks for posting my pic! That’s a funny observation i bet people would really be shakin’ in there boots if one just moved a small bit.